In PTAs, the greatest number of complaints received by parents is that kids don’t listen attentively. That’s not to say that they aren’t doing well, but he can reach his potential with listening intently. When I was young, my parents used to say to me that I could easily do half my exam paper if I just listened carefully to the teacher. The problem with small kids is that they are so full of energy that their attention span can hardly last more than ten to fifteen minutes, that too if they are genuinely interested in what’s happening. Here are a few pointers to help develop this essential skill at home. It would require persistence, as is usually the case with all we do with our kids, but the pay-off will be rewarding. 1. 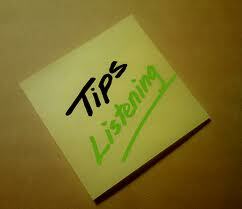 Eyes on the speaker: When doing any instructional task with your child, ask him or her to look at you while you speak. 2. Posture: Leaning back or slacking, drooping or putting the head down and counter productive in attentive listening. Sitting upright is best. 3. Lips closed: No interruptions when you are talking, but they can voice their thoughts when you are finished. You could put up your hand as a sign to remind this to the kids. 4. Teach them to ignore distractions: It is obviously the best case scenario to remove any distractions from the surroundings for grabbing the full attention of the kids, but that may not be possible, so gently keep reminding them to pay attention to you. 5. Bodily movements: Most kids fidget, it’s like a reflex, or they’ll play with their pencil or just randomly move their hands and legs. Again a gentle tap to remind them to stay still will help them hone in to your voice. It’s not a one day course of action, and may take months of practice before the desired effects become apparent, but it will be much worth it. 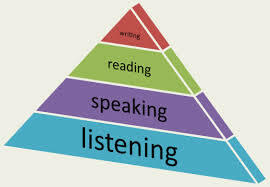 Here is how this particular skill fares in the pyramid of language developmental skills. Of course you can also tell the kids how important listening to the call of prayer is. Similarly listening to the Friday Khutbah has great importance. Reverence to listening to the Holy Quran is included and the importance of listening to parents and teachers, It always pays to give little reminders. This entry was posted in English and tagged English, listening skills, tips on November 8, 2014 by rahimajabeen.